The of majority of Mr. Machin’s work focuses on defending employers and insurance carriers against claims arising under the Defense Base Act and the Longshore and Harbor Workers’ Compensation Act. 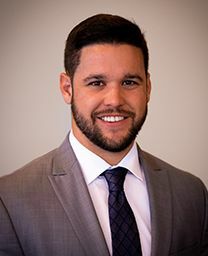 Mr. Machin graduated with a Bachelor of Arts in Political Science from North Carolina Wesleyan College in 2015 where he was a member of the baseball team as well as holding All-Conference All-Academic team all four years. Mr. Machin graduated from St. Thomas University School of Law in 2018 with a Doctor of Jurisprudence where he was multiple semesters on the Dean’s list and served as the President of the Maritime Law Society. Additionally, Mr. Machin graduated with over 300+ hours of pro bono legal work. Mr. Machin’s prior experience includes two internships at the United States Coast Guard District 7 Legal Office and a clerkship at the United States District Court for the Southern District of Florida for the Honorable Judge John O’Sullivan. Admitted to Florida bar, 2018.